Woodland Caribou, classified as a species-at-risk both federally and provincially in Alberta and British Columbia, has a high public profile in Western Canada. Although the exact number of caribou in each of the populations remains uncertain, the best available science indicates that most have declined over the past 20 years. Declines in caribou populations across Western Canada are linked to habitat alteration, a warming and drying climate, and in particular, altered predator-prey dynamics resulting from increasing human footprint in caribou range. Habitat alteration resulting from both industrial activities (e.g., forestry, energy development) and natural disturbance (e.g., wildfire), in combination with milder winters, favours an increase in the abundance and distribution of moose and deer, and concomitantly wolves, which prey on these species. The increase in the number of wolves results in an unsustainable increase in caribou mortality. 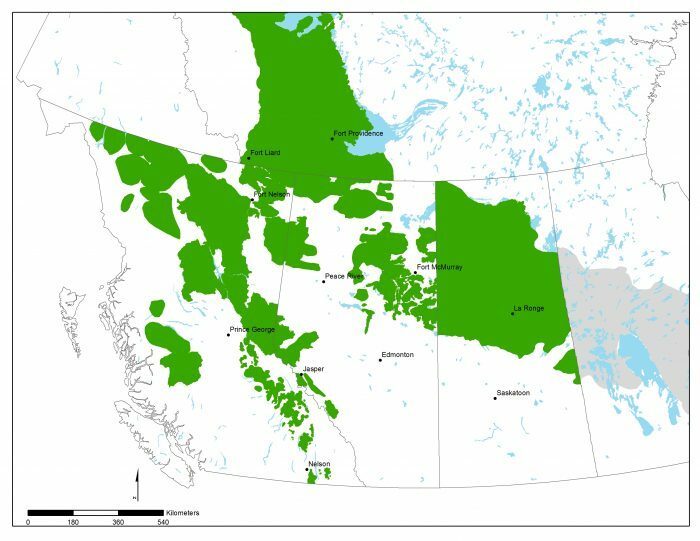 The Alberta Biodiversity Monitoring Institute’s (ABMI) Caribou Monitoring Unit (CMU) was developed to support woodland caribou recovery in Canada. The CMU works with academics, industry, and government to facilitate applied research and provide scientific expertise to evaluate and monitor caribou recovery options. Current CMU projects range from prioritizing areas for habitat restoration to determining how predator numbers and landscape features affect caribou populations. The CMU continues to develop relationships with stakeholder groups and support efforts to increase our collective understanding of issues facing boreal woodland caribou in Western Canada.